Other parks to get cash include South Cliff Gardens in Scarborough, Castle Park in Bishop's Stortford and Ellington Park in Ramsgate. The Grade II registered Sydney Gardens were designed in the late 18th Century, and became Austen's local park when she moved to the city. 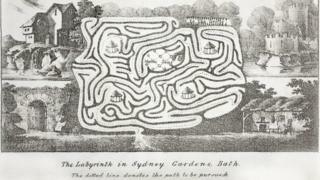 Before she arrived she wrote: "It would be very pleasant to be near Sydney Gardens! We might go to the Labyrinth every day!" Improvements to the gardens will include a new cafe, play areas, and the restoration of features such as the Minerva's Temple and the Grade II listed canal footbridge. Ros Kerslake from the HLF said: "The health and wellbeing benefits of local green spaces were well known in Jane Austen's time and remain true today. "They are home to some of the country's most cherished heritage and provide fantastic opportunities for enterprise and community activities." South Cliff Gardens in Scarborough has been given £4.66m to restore features such as the Italian steps, the clock tower, railings, fencing and footpaths, while Bishop Stortford's Castle Park is getting £1.94m to protect the ruins of Waytemore Castle, which dates back to at least the 1080s. Ellington Park in Ramsgate, which dates back to the 13th Century, will receive £1.64m to restore features such as a dilapidated Victorian bandstand, benches and lamps. Nearly £1.48m of funding has been given to Fairhaven Lake and Gardens, which was built on the Lancashire coast between Lytham and St Anne's in the 19th Century and hit its heyday in the 1950s and 1960s. The cash will help to improve the water quality to protect fish and a population of threatened glass eels, while a Japanese water garden that was filled in during the 1980s will be restored. Stevens Park in Dudley will receive almost £1.4m to improve access and security to the Grade II listed peace gardens, and other improvements to other features.